Fear. One little word that encapsulates an incredibly powerful force. We face it consistently in our lives from large scale, life-altering events to the daily moments that make your stomach drop and your brain hit the brakes. Fear manifests itself in many ways, and no matter how much we don’t like experiencing it, we can’t avoid it. We have to react to it. And it is in that reaction that we learn so much about ourselves: our limits, our priorities, our values… a sudden revealing of who we are at our most vulnerable core. I will admit that I’m not someone who handles fear well. I often feel like I have a permanent address in the flight camp of the fight or flight response. I’m not very outspoken, I often care too much about what other people think, and my instincts always tell me to shy away from anything that causes even the slightest amount of fear to bubble up in the pit of my stomach. So I approach every situation with as much planning and caution as I can muster to avoid any possibility of being paralyzed by fear – fear of saying the wrong thing, of having the wrong opinion, of not being as smart, funny, or [insert any positive character trait here] as my peers, fear of failing, of falling behind, of being in danger, of not knowing how to handle the situation I’m in, and most of all, fear of disappointing others. I don’t like being fearful, and yet fear has played a prominent role in who I have become today. I know this probably won’t be a great revelation to any of you reading this – everyone’s lives are shaped by their fears and how they handle them. But the past couple months have been a particularly reflective season for me, so I suppose this awareness of my fears and how I interact with them has been on my mind quite a bit. AND since it’s my two year blog-iversary, (that’s right – two years!!! Where has the time gone?!) it feels fitting to share some of my musings as I look forward into the year ahead. This past year, my love of flowers has helped change how I interact with the fears in my life. As someone who is usually completely risk averse, I have found myself taking more risks and sticking my neck out a bit, not because I’m being forced to do so but because I have a found a passion that truly makes me believe that the risk can be worth the reward. I love this art form so much that I am completely at peace with owning my goals and opinions despite what other people may think. I have taken steps of faith trusting that God will provide the opportunities I dream about and am working to make happen. So from the many, many years that I have let fear negatively drive my decisions and my plans, it has been through this gift of flowers that I am finally learning that fear can be conquered and drive you forward rather than leaving you stuck in the mud unable to move. 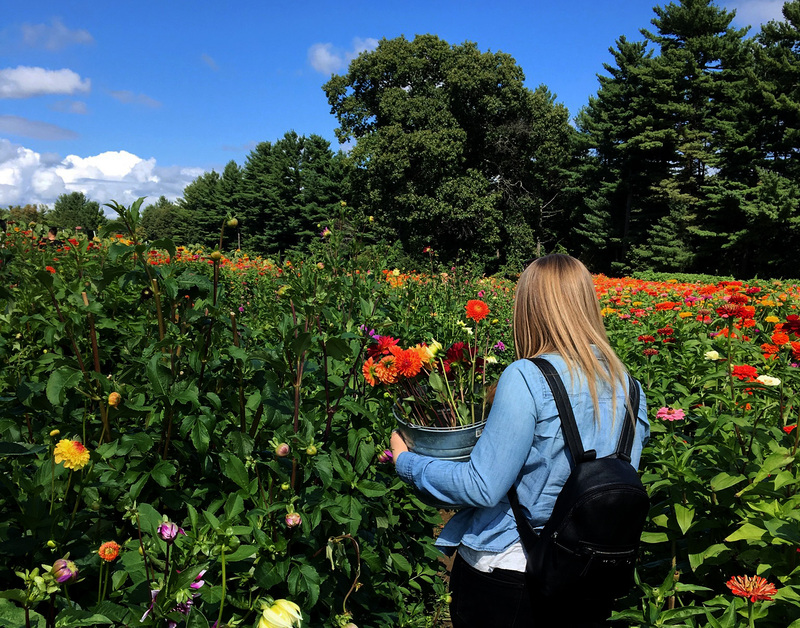 That afternoon in the flower field, I was faced with two reactions – stand on the sidelines and let my fear prevent me from enjoying our adventure, or take hold of my fear and step into unknown territory that could produce so much growth and beauty if I let it. So… I took a deep breath and walked into the shoulder high rows of flowers. I picked so many beautiful flowers that day, spent some lovely quality time with my dear friend K, and the best part – the bees kept all to themselves in their floral heaven. Not once did I feel the need to run, not once did I flinch, and at the end of the day, I felt like I could almost hear God saying, “See? I told you it would be worth it.” I know that not every experience of facing my fears will go quite that smoothly, but I learned in the best way possible what wonderful things can come from kicking fear out of the driver’s seat. Before this past year, if she wasn’t directly in the driver’s seat, fear was riding shotgun – navigating my path and giving me a false sense that I was calling the shots on where I was going when in fact she was the one with the map in her hands. But I think it’s time to tell fear to get in the back seat. I’ve learned to bring her along for the ride because she’ll always be somewhere in the car, but despite her attempts to be a back seat driver, she doesn’t get to call the shots anymore. I know where I want to go in the year ahead, and she’s not going to stop me. So here we go… another year of flowering and a new season ahead! Just wait and see what’s coming down the pipeline in 2018! An extra special thank you to my friend K from KARMOMO for joining me on this adventure and taking many of the lovely photos you see featured here! If you have an event or wedding for which you are needing a florist, I am booking for 2018! Please email me at britni@twostemsofjoy.com to discuss your custom floral package. If you’re on Instagram and Facebook, please follow @twostemsofjoy to see the pictures from my posts, as well as other snapshots that don’t make it onto the website. Thank you! That is such an awesome post Britni! Much of your propensity for fear comes genetically from yours truly (your fa-sha) so I found your insights and ability to “put fear in its rightful place” quite uplifting this morning. I have a computer monitor sticky note right in front of me that says “trust displaces fear and worry.” I also repeat daily three words that forever changed my world when I heard them earlier this year in a sermon by Paster Daniel Voss in Arizona – “fear is irreverent.” Through that lens I came to realize my fears were often trumping my faith, and as a follower of Jesus Christ, that is not at all acceptable. I am certain God has great things ahead for you and I am proud of how you are facing your fears. I clearly remember that day on the road between Browerville and Staples when Mom took that sunflower photo – and I am proud to say that I clearly see how God has woven His trust into your life to make you victorious over fear. Next time we are together let’s have some honey to celebrate!!! Love you. Britni! This is such a fantastic post! It really hits home with me and, I’m sure, many others. What is ironic about this, to me, is that I think you’re a very brave person for course correcting, if you will, and and becoming an entrepreneur! And you say you’re risk adverse? I don’t believe it! But, I guess bravery isn’t necessarily the absence of fear, but a willingness to stand up to it. You have done that. Good for you! I do appreciate how you acknowledge that fear will never go away, we just need to put it in it’s place. In fact, I don’t believe fear itself is a bad thing. It’s our protection gauge. But, as you say, it just needs to take a back seat, because that gauge can sometimes go haywire. I am very proud of you and excited about your journey this year! Thank you, Marana! I am so encouraged by your compliments and your perspective to remind me that maybe I’m a little braver than I give myself credit for 🙂 Thank you so much for supporting me and my business this year and thank you for sharing in my excitement for the year to come! Happy New Year!